Dr. Balci is an Assistant Professor, Department of Radiology, Saint Louis University School of Medicine, St. Louis, MO. Dr. Semelka is a Professor and Dr. Altun s a Research Fellow, Department of Radiology, The University of North Carolina at Chapel Hill, NC. Image quality, reproducibility of image quality, and good conspicuity of disease requires the use of sequences that are robust and reliable and that avoid artifacts. 1-5 Maximizing these principles to achieve high-quality diagnostic magnetic resonance (MR) images usually requires the use of fast scanning techniques with diagnostic image quality. Respiration, bowel peristalsis, and vascular pulsations result in artifacts that have lessened the reproducibility of MR imaging (MRI). Breathing-independent sequences and breath-hold sequences form the foundation of high-quality MRI studies of the abdomen. Disease conspicuity depends on the principle of maximizing the difference in signal intensities between diseased tissues and the background tissue. For disease processes situated within or adjacent to fat, this is readily performed by manipulating the signal intensity of fat, which can range from low to high on both T1-weighted (T1W) and T2-weighted (T2W) images. For example, diseases that are moderate to high in signal intensity on T2W images, such as inflammatory exudates or ascites, are most conspicuous on sequences in which fat signal intensity is rendered low with fat suppression. Gadolinium chelate enhancement may routinely be useful because it provides at least 2 further imaging properties that facilitate the detection and characterization of disease-specifically, the pattern of blood delivery (ie, capillary enhancement) and the size and/or rapidity of drainage of the interstitial space (ie, interstitial enhancement). 6 Capillary-phase image acquisition is achieved by using a short-duration sequence initiated immediately after gadolinium injection. The majority of focal mass lesions are best evaluated in the capillary phase of enhancement, particularly lesions that do not distort the margins of the organs in which they are located (eg, focal liver, spleen, or pancreatic lesions). Images that are acquired at 1.5 to 10 minutes after contrast is administrated are in the interstitial phase of enhancement; the optimal window is 2 to 5 minutes postcontrast. Diseases that are superficial, spreading, or inflammatory in nature are generally well shown on interstitial-phase images. 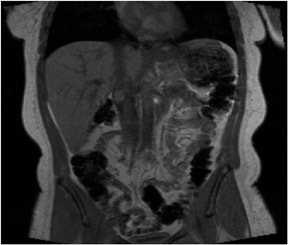 The concomitant use of fat suppression serves to increase the conspicuity of disease processes that are characterized by increased enhancement on interstitial-phase images, including peritoneal metastases, cholangiocarcinoma, ascending cholangitis, inflammatory bowel disease, and abscesses. MRI strategies are also very important to obtain sufficiently diagnostic images from all patients, including noncooperative ones. The great majority of diseases can be characterized by defining their appearance on T1W, T2W, and early and late postgadolinium images. In this way, the variety of information describing the different features of diseases and organ systems can be obtained comprehensively. Also, with the use of a diverse group of sequences acquired in multiple planes, target lesions can be characterized and the likelihood of not detecting or of misclassifying disease is minimized. The length of examination time should be short to increase patient cooperation and throughput; therefore, shorter-duration breath-hold or breathing-independent sequences should be applied in the examination protocols. To decrease the length of examinations and to make them more reproducible and standard, the use of set protocols is needed. In addition, the protocols should have some minor redundancy to allow for the possibility that some of the sequences may be nondiagnostic (because of some patient factors, such as motion), and so the remaining sequences should provide sufficient diagnostic information. The MR examination protocols differ for the upper abdomen and the pelvis as well as for the disease processes involved. When only one phased-array coil is used for an examination that is to include the upper abdomen and pelvis, the most efficient way to perform the examination is to complete the upper abdomen study first and continue with the pelvis later. In this way, table motion and repositioning of the coil are minimized. 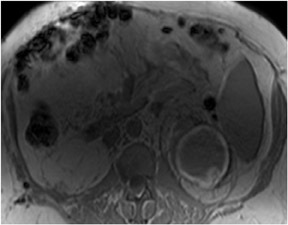 If multiple phased-array coils are used simultaneously together with remote table motion, as in current MRI systems, there will be no need for repositioning the coil, so the length of examination will be decreased and precontrast pelvis images may be obtained, if necessary (eg, in the evaluation of endometriosis). With the use of phased-array multicoils, both slice thickness and field of view can be substantially modified for many patients. One of the most important recent developments is the parallel imaging technique, which requires specialized multichannel coils. The benefits of decreasing sequence duration and increasing spatial resolution are only now beginning to be realized. Dramatic improvements in these areas are expected in the near future and will likely greatly increase the role of body MRI. 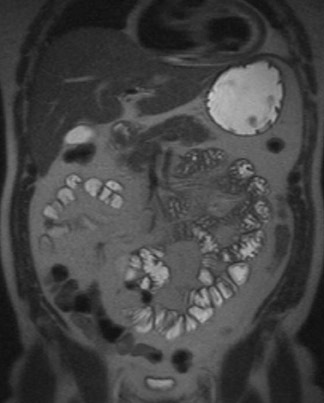 The basic approach to all body MRI examinations is to obtain at least one noncontrast T1W sequence (a standard non- fat-suppressed sequence is always advisable; often, out-of-phase and fat-suppressed sequences are useful additions), one T2W sequence (often a single-shot echo-train technique is sufficient), and immediate postgadolinium and 2-minute postgadolinium T1W gradient-echo sequences. A brief description of these sequences follows. T1-weighted sequences are routinely useful for investigating diseases of the liver. The primary information that precontrast T1W images provide includes: 1) information on abnormally increased fluid content or fibrous tissue content that appears low in signal intensity on T1W images; and 2) information on the presence of subacute blood or concentrated protein, which are both high in signal intensity. T1-weighted sequences obtained without fat suppression also show the presence of fat as high-signal-intensity tissue. The routine use of an additional fat-attenuating technique facilitates reliable characterization of fatty lesions. Spoiled gradient-echo (SGE) sequences are the most important and versatile sequences for studying liver disease. Image parameters for SGE are: 1) relatively long repetition time (TR) (approximately 150 msec) to maximize both the signal-to-noise ratio and the number of sections that can be acquired in one multisection acquisition; and 2) the shortest in-phase echo time (TE) (approximately 6.0 msec at 1.0T and 4.2 to 4.5 msec at 1.5T) to maximize both the signal-to-noise ratio and the number of sections per acquisition. 2 Hydrogen protons in a voxel that contains 100% fat will precess approximately 220 to 230 Hz slower than a voxel composed of 100% water, at 1.5T. That means that every 4.4 msec, the fat protons will lag behind by 360˚and will regain in-phase orientation relative to the water protons, while at 2.2 msec, or at half this time, the fat and water protons will be 180˚out-of-phase. Current-generation MR software programs have incorporated dual-echo breath-hold SGE sequences that can acquire 2 sets of k-space filled to obtain 2 sets of images-one set in-phase, the other out-of-phase-with spatially matched slices. For routine T1W images, in-phase TE may be preferable to the shorter out-of-phase TEs (4.0 msec at 1.0T and 2.2 to 2.4 msec at 1.5T), to avoid both phase-cancellation artifact around the borders of organs and fat-water phase cancellation in tissues containing both fat and water protons. The flip angle should be approximately 70˚to 90˚, to maximize T1W signal. With the use of the larger built-in body coil, the signal-to-noise ratio of SGE sequences is usually suboptimal with a section thickness <8 mm, whereas with the phased-array surface coils, a section thickness of 5 mm results in diagnostically adequate images. Out-of-phase (opposed-phase) SGE images are useful for revealing diseased tissue in which mixtures of fat and water protons are present within the same voxel. A TE of 2.2 msec is advisable at 1.5T, and 4.4 msec is advisable at 1.0T. A TE of 6.6 msec is also out-of-phase at 1.5T, but the shorter TE of 2 msec is preferable because of decreased susceptibility effects. In combination with a T2W sequence, it is easier to distinguish fat and iron in the liver. 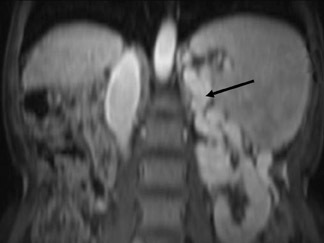 The most common indications for out-of-phase imaging are the detection of abnormal fat accumulation within the liver and the detection of lipid within adrenal masses, a feature used to characterize benign adrenal adenomas (Figure 1). 2.5 msec at 1.5T), which benefits from additional fat-attenuating effects and also increases signal-to-noise ratio and the number of sections per acquisition. 4 On current MRI machines, fat-suppressed SGE may acquire 22 sections in a 20-second breath-hold, with reproducible uniform fat suppression. One method that modern systems use to reduce the amount of additional time that fat suppression adds to the SGE sequence and to acquire a greater number of slices per breath-hold is to perform a fat-suppression step only after several phase-encoding steps, instead of after every phase encode. Another approach is to selectively tune the stimulation radiofrequency (RF) pulse to activate only protons in water, but not in fat, thus eliminating the need to add fat-saturation pulses. This technique is referred to as water excitation . Fat-suppressed SGE images are used to improve the contrast between intra-abdominal fat and diseased tissues and blood vessels on interstitial-phase gadolinium-enhanced images. Gadolinium enhancement generally increases the signal intensity of blood vessels and disease tissue, and fat suppression diminishes the competing high signal intensity of background fat. One limitation of GE sequences, both 2D and 3D, is relative motion sensitivity, and, thus, the requirement for cooperation by the patient in following breathing instructions. In uncooperative patients, GE sequences may be modified as a single-shot technique using the minimum TR to achieve breathing-independent images (Figure 4). Such sequences have included so-called magnetization-prepared rapid-acquisition gradient echo (MP-RAGE), and turbo fast low-angle shot (turboFLASH). This technique has been achieved using magnetization-prepared GE, in which an inversion prepulse leads to the ability to improve T1W contrast during a short single-slice acquisition. As the protons recover magnetization, a single-slice short TR GE imaging sequence is performed. An inversion time of approximately 0.5 second provides optimal T1W contrast and sufficient time to allow the protons to recover between slices, which leads to an effective slice-to-slice TR of ≥1.5 seconds. This technique can be performed to yield either bright or dark through-plane flowing blood, by making the prepulse either slice-selective or nonselective, respectively. Limitations of this technique have included the inability to obtain as high or as predictable T1W contrast as with standard SGE. 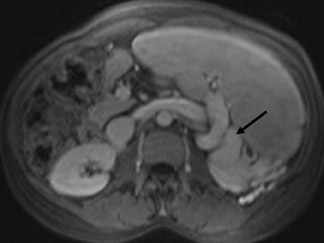 Another limitation is that the magnetization-prepared GE slice-by-slice technique is not ideal for dynamic gadolinium-enhanced imaging of the liver, particularly during the hepatic-arterial dominant phase. As each slice requires approximately 1.5 seconds for acquisition, the time difference accumulated between the top and bottom liver slices is too great to capture the entire liver in the arterial phase of enhancement. 4 Nonetheless, slice-selective inversion-pulse single-shot T1W GE allows contiguous acquisition of slices without a need for time delay between slices. The predominant data provided by T2W sequences are: 1) the presence of increased fluid in diseased tissue, which results in high signal intensity; 2) the presence of chronic fibrotic tissue, which results in low signal intensity; and 3) the presence of iron deposition, which results in very low signal intensity. The principle of echo-train spin-echo sequences is to summate multiple echoes within the same TR interval to decrease examination time, increase spatial resolution, or both. 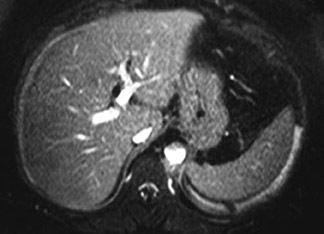 We routinely use a single-shot technique for liver imaging: either half-Fourier acquisition single-shot turbo spin echo (HASTE) or single-shot fast spin echo (SSFSE). This is a slice-by-slice technique in which a single slice-selective excitation pulse is followed by a series of echoes, typically using between 80 and 100 180˚pulses, each separated by approximately 3 msec, to fill in k-space for the entire slice. The T2W contrast is achieved by using the echoes obtained approximately 80 to 90 msec for filling central k-space, where central k-space is responsible for image contrast. Although the theoretical TR is infinite, each slice requires roughly 1.2 to 1.5 seconds before continuing to the next slice. However, the motion-sensitive component represents only a smaller fraction of the entire acquisition period, which makes this technique relatively insensitive to breathing or other motion artifacts. The multiple 180° pulses serve to minimize magnetic susceptibility by limiting T2* decay. Echo-train spin-echo has achieved widespread use because of these advantages. In contrast, conventional T2W spin-echo sequences are lengthy and suffer from patient motion and increased examination time. The major disadvantage of echo-train sequences is that T2 differences between tissues are decreased. In the liver, the T2W signal difference between diseased and background normal liver may be small, and the T2-averaging effects of summated multiple echoes blur this T2 difference. This results in relatively diminished lesion conspicuity for lesions with mildly elevated T2 signal intensity, such as hepatocellular carcinoma, as compared with standard spin-echo sequences. Fortunately, diseases with T2 values similar to those of liver generally have longer T1 values than liver, so that lesions poorly visualized on echo-train spin echo are generally well visualized on SGE or immediate postgadolinium SGE images as low-signal lesions. Echo-train spin-echo sequences-and T2-weighted sequences, in general-are important for evaluating the liver. 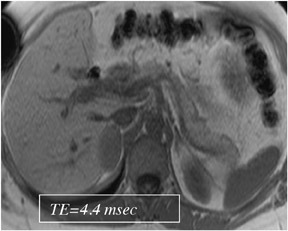 In liver masses, T2W images are predominantly important for lesion characterization, while T1W images are important for both lesion detection and characterization. 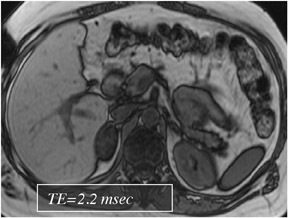 T2weighted images also are important for the assessment of diffuse liver disease, including iron deposition, edema related to active liver disease, and fibrosis. Echo-train T2W sequences are important for assessment of fluid-filled structures, including the bile duct, gallbladder, and pancreatic duct, and the stomach and bowel as well as cysts or cystic masses, abscesses or collections, or free fluid in the abdomen or pelvis (Figure 5). The relative resistance of echo-train images to motion degradation generally yields better resolution of structures internal to cystic masses, such as the septations within a pancreatic serous or mucinous tumor. MR cholangiopancreatography is based on modified echo-train sequences, in which the effective TE becomes longer- approximately 250 to 500 msec. Lengthening the TE results in heavily T2W high-contrast images that yield most soft tissues dark and that make fluid in the bile ducts, gallbladder, and pancreatic duct very bright. MR cholangiopancreatography can be performed in thin sections (3 to 4 mm) for higher resolution, or using a single thick slab of 3 to 4 cm, to include the majority of the pancreatic and bile ducts in a single image. 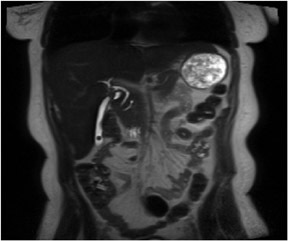 T2-weighted single-shot echo-train imaging is well suited to studying the bowel because of insensitivity to both respiratory motion and bowel peristalsis, and the relative resistance to the distorting paramagnetic effects of intraluminal bowel gas because of the repeated refocusing echo pulses. MRI performed using a combination of various short-duration sequences employed in a set imaging protocol will detect the great majority of disease processes in the abdomen and pelvis with very high sensitivity and specificity and with high patient safety. With the use of motion-insensi-tive T1W and T2W sequences, MRI has a very high diagnostic accuracy even in noncooperative patients. The development of volumetric imaging sequences together with the development of faster and artifact-insensitive sequences employing parallel imaging will even further increase the diagnostic role of MRI in the near future. Fundamentals of MR imaging techniques applied to the abdomen and the pelvis. Appl Radiol.